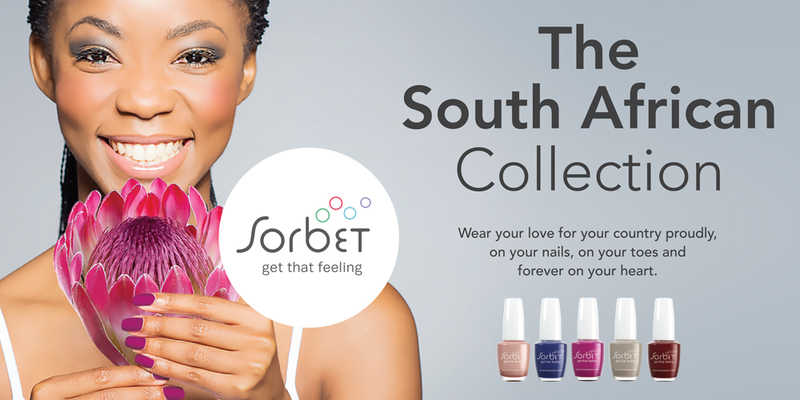 This June, Sorbet launches a Salon First in SA, with a brilliant new five-colour nail polish collection that celebrates the iconic beauty of something that beats closest to its heart: our exquisite homeland, South Africa. Because, while we all love a little international flavour (including wild “Vegas Nights”, sultry “Moroccan Nights” or even exotic trips to “Ivory Coast”), let’s face it: Sorbet girls are home girls at heart, and we wear our patriotism proudly – in red, white, green, yellow, black, white and blue! Come June 2016, you can wear your love for your country not only on your heart but on your nails too – in five gorgeous new hues. The colours in Sorbet’s new South African collection celebrate some of the best-loved sights and places of a country we call “home”. “Safari Sunsets” is a tribute to fiery marmalade skies as seen from across the savannah in places like the majestic Kruger National Park. “Table Mountain Dreaming” celebrates one of the official Seven Wonders of the World, as she reigns supreme in our own exquisite Mother City. Our national flower, found growing wild on the mountainous slopes of the Cape Floral Kingdom, provided inspiration to our third colour, “Cape Protea”- Jozi’s own signature spring blossom – which literally lights up streets and neighbourhoods in brilliant purple – inspired “Jacarandas in Bloom”. And last, but definitely not least, “City of Gold” features as our sparklingly diverse Jozi: the heartbeat of our economy and, in many senses, the pulse of our complex yet beautiful nation. Look out for the collection in all Sorbet stores – Which colour will you be sporting?